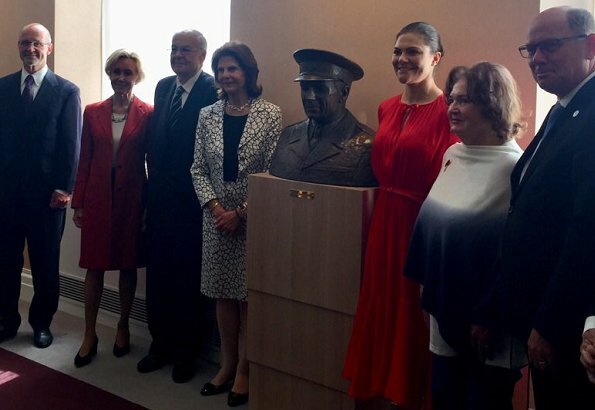 On May 29, 2018, Queen Silvia and Crown Princess Victoria of Sweden attended the unveiling of a bust honouring Count Folke Bernadotte at the Riksdag in Stockholm. 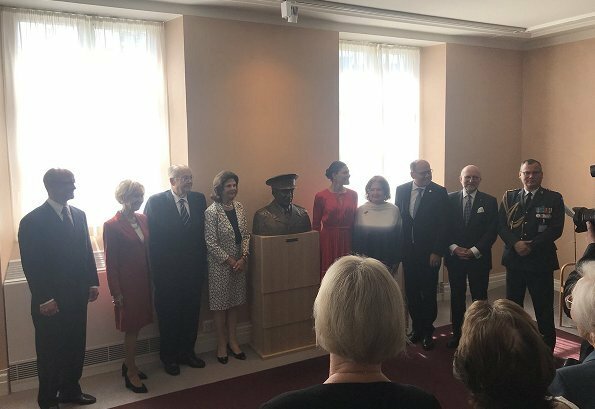 At the opening, Folke Bernadotte's son count Bertil Bernadotte was also present. Swedish diplomat Folke Bernadotte was King Carl XVI Gustav’s godfather and his father’s cousin. The Count of Bernadotte helped to save tens of thousands of prisoners from German concentration camps during World War II before his death in 1948. 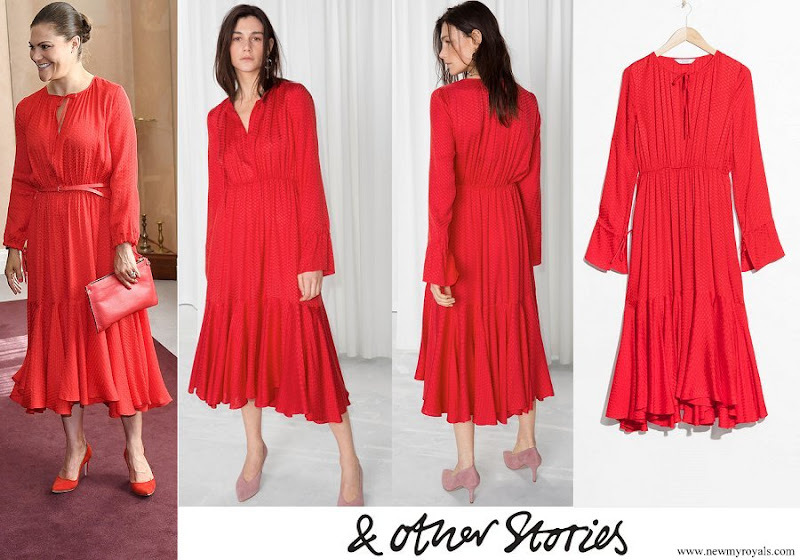 The Crown Princess wore a new red dress by &Other Stories. Nice red dress Victoria look really good in it,but to much material on the bottom of the dress.Her hair and makeup are very nice and of course her smile. Lovely bright and cheerful dress. Lovely color on Victoria and pretty shoes. Please, not the bun again. Lovely dress, not a flower in sight! Booring hair. Why can’t she copy her mother? Silvias hair is always lovely. She has the best hairdos of all royals - or maybe the best hairdresser? Severely pulled back hair does not suit even the prettiest woman on earth. Her bun is atrocious, ok for hiking like she often does, but not for formal occasions. She would be so much better looking with loose hair. Both Royal Ladies look very good,after a very busy Weekend! Victoria won't change, I think we need to get used to her bun. I just hope little beautiful Estelle won't have to pull back her hair to a bun or a ponytail all the time because mummy prefers that. I like the dress, but I do not like the clutch-thing. She has a couple of those. 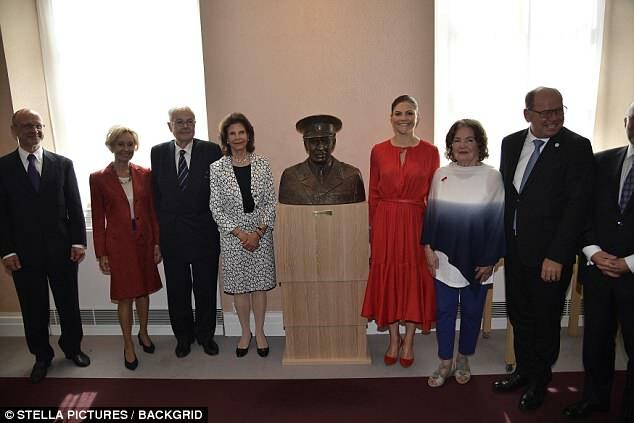 Both of Queen Silvia and Princess Victoria of Sweden look wonderful. What a beautiful dress Victoria wears! Suits her perfect. Love Victoria's red dress. Gorgeous!